Origin and Habitat: Native to Eastern Venezuela,Trinidad, Surinam and French Guiana. 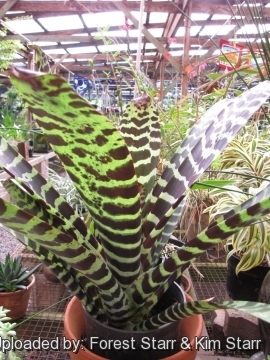 Altitude: Vriesea splendens is typically found at an altitude of 0 to 700 meters. Habitat: In the wild it inhabits in subtropical or tropical moist, dense forests and mountain savanna forest as either an epiphytic (tree dwelling), saxicole (rock dwelling) or terrestrial (ground dwelling) plant. It has adapted to such a wide range of environments in habitat that it also readily adapts in cultivation to be grown in shadehouses, greenhouses and the indoors. Ecology: Each plant establishes its’ own micro habitat, with the gradual build up of humus, mosses and lichens around the root system providing a store of water and nutrients in addition to the reserves held in the copious leaf bases and vases. Hummingbirds are the key pollinators of Vriesea. Vriesea splendens var. longibracteata (Baker) L.B.Sm. Vriesea splendens var. major auct. Vriesea splendens minor Duval ex Wittm. 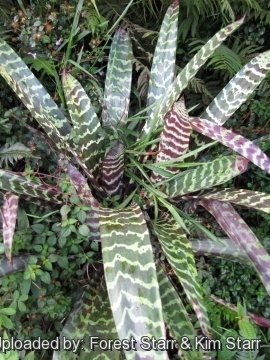 Vriesea splendens var. oinochroma Steyerm. Vriesea splendens var. wardelii auct. Description: Vriesea splendens is a species of flowering plant in the bromeliad family, subfamily Tillandsioideae that features smooth-margined green foliage with prominent dark brown bands across them. The bright red inflorescence in a flattened spike will develop yellow tubular flowers that last only one day each. These plants were introduced to Europe in 1840 following New World exploration and are now among the most widely grown broms. There are many named varieties, which may vary in leaf variegation and the shade of the flowering spike. Rosette: Funnelform up to 90 m wide with relatively few leaves congregate at the base to form a broad funnel that pools water and forest debris for nourishment. This physique enables them to store water for a certain period. Water and nutrients are preferably absorbed through the leaves since the roots primarily serve as adhesion organs. After flowering, the rosette will degrade and eventually die, allowing the young pup offshoots to replace it. Leaves: 20-75 cm long, up to 6,5 cm wide, stiff, strap-like, ligulate or lance-shaped, often arching, horizontally striped with light grey-green bands and dark-green, brown or deep purple-black bands. The leaves have smooth margins and may have colourful bracts at the leaf bases. **Inforescence: The inflorescence is a simple, unbranched, short-stalked, many flowered spike, erect, strongly flattened, narrowly lanceolate or oblong, that rises as a bright scarlet sword up to 55 cm tall and 6 cm wide. The spikes are comprised of distichous (in 2 rows) imbricate (overlapping like tiles or shingles on a roof) , keeled bracts (petal-like leaves) that support little, tubular flowers of bright yellow and short-lived, the bracts are bright red or orange and last for months. 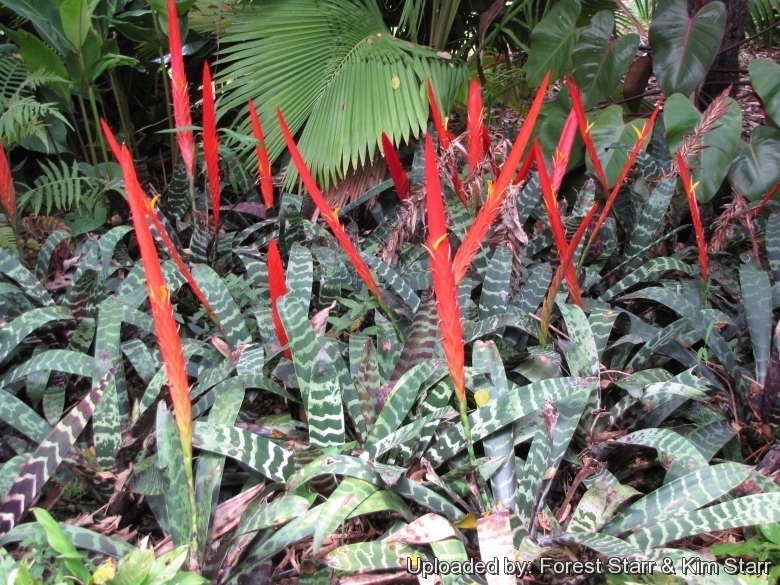 Usually bromeliads do not self pollinate, but there are exceptions to the rule. Such is the case of Vriesea splendens. Blooming season: It takes several of years before plants are mature enough to produce flowers, but once mature they develops a flower spike in mainly the summer and may last for many months. Seeds:*** With basal coma of hairs. Vriesea splendens (Brongn.) Lem. : (var. splendens) has banded leaves. Vriesea splendens var. chlorostachya Oliva-Esteve: has green bracts. Distribution: Venezuelal. Vriesea splendens var. formosa Suringar ex Witte: has leaves without bands. Vriesea splendens var. oinochroma Steyerm. : has leaves with no band. Distribution: Venezuela. 1) Forest & Kim Starr “Vriesea splendens (Flaming sword)”. Plants of Hawaii. <http://www.starrenvironmental.com>. Downloaded on 20 August 2014. 3) Wikipedia contributors. "Vriesea splendens." Wikipedia, The Free Encyclopedia. Wikipedia, The Free Encyclopedia, 6 Jul. 2014. Web. 18 Sep. 2014. 5) Hokche, O., Berry, P.E. & Huber, O. (eds.) (2008). "Nuevo Catálogo de la Flora Vascular de Venezuela" 1-859. Fundación Instituto Botánico de Venezuela. Cultivation and Propagation: Vriesea splendens is a species of flowering plant in the bromeliad family, subfamily Tillandsioideae that features smooth-margined green foliage with prominent dark brown bands across them. 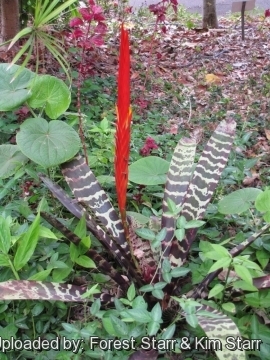 The bright red inflorescence in a flattened spike will develop yellow tubular flowers that last only one day each. These plants were introduced to Europe in 1840 following New World exploration and are now among the most widely grown broms. There are many named varieties, which may vary in leaf variegation and the shade of the flowering spike.